A quick and healthy meal that’s full of flavor. Add Jalapeño Green Curry Bowls to your weeknight dinner rotation! Remember that sauce we made? So good, right? I’ve never met a sauce so full of flavor! 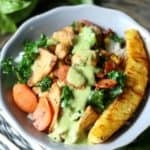 That Jalapeño Green Curry Sauce makes these quick and easy Jalapeño Green Curry Bowls absolutely come to life! This stir-fry has been on regular rotation at my house for weeks. These bowls are a great way to make a quick meal. It’s basically a stir-fry. 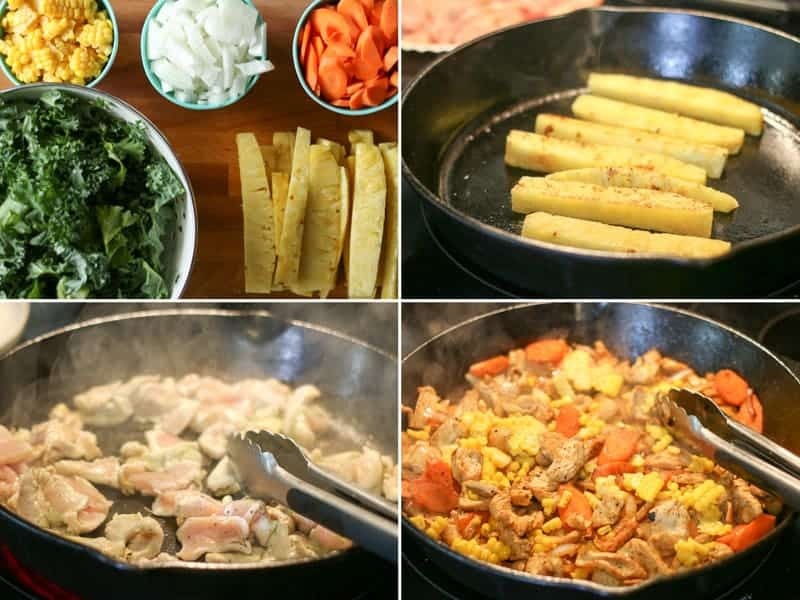 All you need for a great stir-fry is a protein, veggies, and some sort of sauce. (We’ve got the sauce covered.) Serve it all over a big bowl of rice and you’re set to go! 1. Prep the ingredients. Everything cooks so fast that you want to make sure all of your ingredients are prepped before you start cooking. Otherwise you’ll have quite a hectic mess on your hands. Prepping is key. 2. Use a hot pan. Use a pan that can get really hot and stay hot, I like to use a cast iron skillet. I want the chicken to get golden brown and the veggies to get a little char on them. Those brown bits add a lot of flavor. For these bowls I’m using chicken breast, carrots, onions, corn, kale, and pineapple because that’s what was in the bowl (from the Brightwok Cafe) that inspired this recipe, along with that Jalapeño Green Curry Sauce we made. You can use whatever veggies you like or have on hand. I highly recommend the pineapple though! So good! Like we talked about earlier, prep everything before you get started. Make the sauce first. Slice the carrots as thinly as you can with a sharp knife, same goes for the chicken. I buy the pre-chopped kale at my local Aldi. The corn can be used straight from the freezer! Once you cut and prep the ingredients, put the ingredients in bowls or put the cutting board next to where you will be cooking. First, sear the pineapple until it’s caramelized a bit and warmed through. Pull those out and set aside. Then sear the chicken. Next, toss in the carrots. Those will need to cook for a few minutes. When they start to get a bit tender, add in the onion and cook until softened. Lastly add in the corn and kale. Cook until the kale has wilted a bit. That’s it! Scoop the mixture out over a bowl of rice and place a pineapple spear on top. Drizzle with our awesome Jalapeño Green Curry Sauce and enjoy! A quick and healthy meal that's full of flavor. 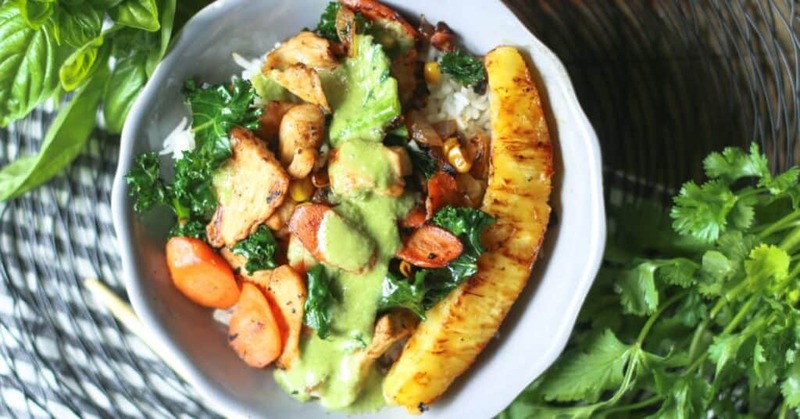 Add Jalapeño Green Curry Bowls to your weeknight dinner rotation! Make the Jalapeño Green Curry Sauce. Thinly slice the carrots and dice the onion. Measure out the corn and kale. Cut the pineapple into spears about 1-inch thick. Set all the ingredients aside, next to the stovetop. Thinly slice the chicken breast. Set aside with the other ingredients. Heat a cast-iron skillet over med-high heat with about 1 tablespoon of oil. When hot, place the pineapple spears into the pan and allow them to lightly brown on all sides. When caramelized and warmed through, remove the pineapple and set aside. Put the chicken into the pan. Spread it out and allow it to sear on the first side until golden brown. Flip the chicken and continue to sauté on all sides, about 5 minutes. When the chicken is cooked almost through, add in the carrots and allow to sauté until the carrots start to soften, about 5 minutes. Add in the onion and sauté until tender, another 2-3 minutes. Add in the corn and kale. Sauté 2-3 more minutes until the kale has wilted. Once wilted, remove the pan from heat. Add in a few tablespoons of the Jalapeño Green Curry Sauce and stir to coat. Gather bowls for serving. Put a serving of steamed rice in a bowl, top with the chicken and vegetable mixture, a pineapple spear, and more Jalapeño Green Curry Sauce to taste. Serve immediately. This curry bowl looks YUM!! !